Is your product or service on a path to irrelevance? 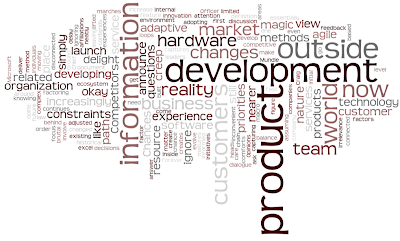 Situation: You are developing a product based on a limited understanding of your market. You are factoring in technology, supply chain, resource, and other constraints. Time marches on. The macro environment changes. Competitors announce. Prospective customers and partners you “owned” announce affiliations with competitors. You get nearer and nearer product launch. Some of the previous constraints are lifted. Your resource picture changes. People come and go. The ecosystem continues to evolve. Technology matures. And so on. Are you even in tune with changes? Have you adjusted your initial product definition knowing that all things “outside” have changed? Chances are if you are like most organizations developing products and services the answer to these questions is a resounding NO. You’re still stuck in a historical internal view. Your market or customer requirements document is unchanged, assuming you had one in the first place. You are simply moving too fast but now quite possibly on the wrong thing. So ask yourself and your organization a few questions. How are you capturing information outside of your organization? What method do you use to factor this information into your business priorities and development path? Are you ignoring reality seeking the comforts of a more simple view of the world? How are you using outside information to make more informed decisions inside? Does your product development team have any dialogue related to adaptive or agile development methods? Are you business leaders part of the discussion or do they simply trust the development team to deliver magic and delight customers. Do you have and do you pay attention to any feedback loops built into your existing products? See related post on Sensors in the Ground. Opinions vary on whether software creates the magic behind hardware or if hardware rules. Still others opine it is all about service. In reality, customers care about experiences and those experience more and more involve some level of hardware, software, and services. Chances are you company doesn’t excel in all 3 areas. It doesn’t matter. You have to figure out how to create the right experience for you customer in an increasingly complex, and connected world. And when your development initiatives are disconnected from the outside world you are increasingly leaving innovation to chance.